When I open up the eBay app to shop for Chanel sunglasses, there are a few things that matter to me: the brand, the style and that I’m buying them from a seller who has experience. So how can I tell which sunglasses are right for me? We have added ‘Why to Buy’ signals that will quickly highlight the reasons you should buy the item you’re looking at. The ‘Why to Buy’ signal intelligence uses data and machine learning to help you confidently make your purchase. Machine learning is the “brain” behind these signals and constantly optimizes along dimensions such as price, popularity and rarity. We want to simplify the decision-making process with these signals so it’s easier for you to find the things you really want. The signals range in focus from free and fast shipping to urgency, or how many items are in stock. Since we launched these signals on desktop in 2015, we’ve learned which signals give buyers more confidence to make their purchases. 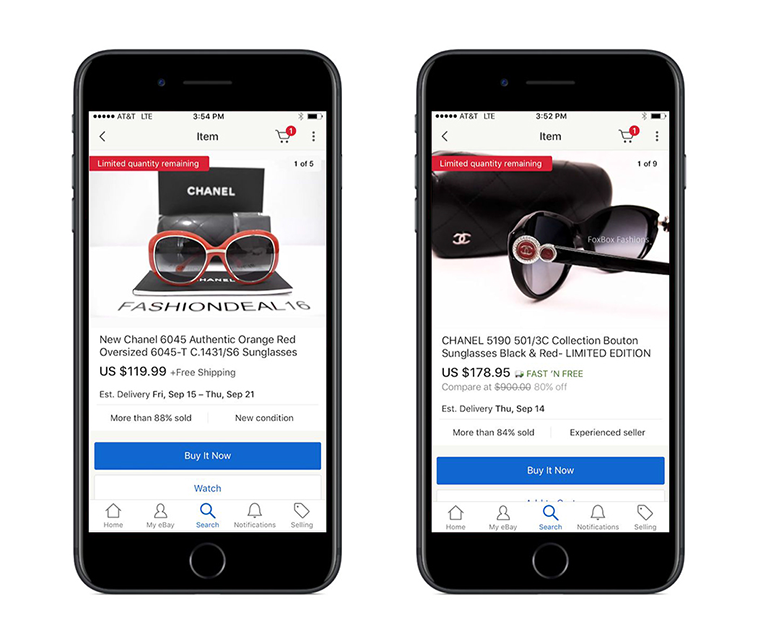 Now, we’re expanding these signals to eBay’s mobile apps and honing in on what’s most important to buyers. Overall, we’ve seen signals such as ‘Free in-store pickup,’ ‘Experienced seller’ and ‘Limited time remaining’ perform the best across all of our inventory. For fashion listings, signals that indicate popularity, rarity and return options matter. For electronics listings, savings, urgency, good shipping and return signals are critical. For rare inventory such as collectible items, trusted seller, savings and lower charges for customs matter, especially while buying across regions. By highlighting relevant, accurate signals, we can make it simpler for you to decide on a purchase. For example, you can see that the Chanel sunglasses above are sold by an experienced seller and that they are selling fast with the “Limited quantity available” signal – showing that they are a popular item and that, if you really want them, you should jump on the deal because they might not be available much longer. As the ‘Why to Buy’ signal intelligence expands to additional platforms, we continue to address the most challenging questions such as what is the ideal signal criteria, number of signals, order and interaction effect, and we continue to test different machine learning models. The ‘Why To Buy’ signals are currently live on desktop, iOS and Android in the U.S., U.K., Germany and Australia and will be rolling out to mWeb soon. Sasi Somasundaram is Group Product Manager at eBay, where she and her team focus on providing a compelling, personalized and engaging item experience and buying flows for the 1.1 billion listings in our marketplace as well as catering to the needs of eBay’s diverse global users.